The board of a large Swiss charitable foundation was looking to include sustainability criteria in the management of its endowment. It also wanted to include sustainability in its investment guidelines and ensure its wealth was employed in a way that supported the foundation's overall mission. With little experience applying sustainable investing techniques to a large portfolio, it decided to turn to Credit Suisse for advice. Charitable foundations today find themselves under increasing public and regulatory scrutiny regarding their management, governance, and investments. Donors, beneficiaries, and others are seeking more transparency in terms of a foundation's investment strategy, and regulators around the world are increasingly recommending that foundations align their investment strategy with their mission and sustainability criteria. This particular Swiss foundation was no exception. That is why its board, like many other foundation boards around the world, decided to include sustainability in its investment guidelines and employ sustainable investing techniques – in alignment with its mission – in the management of its endowment. Sustainable investing offers foundations many potential benefits. It can help them avoid investments that conflict with their mission, and so protect them against reputational risk. Designing a portfolio with environmental, social, and governance (ESG) criteria in mind can substantially improve its long-term risk/return profile, helping to manage risk on the portfolio level as well. Sustainable investments can also help foundations support their mission with targeted investments that make a positive impact in the areas they concentrate on while also generating a financial return. Alternative investments in sustainable real estate, to take one example, can help diversify and add performance to a portfolio – a welcome addition in today's low-interest environment – while reducing a foundation's carbon footprint. While sustainable investing has many advantages, it is not a straightforward process. Investors must have a clear understanding of the criteria they are using, and the means to screen all their investments against these criteria. There are also different screening approaches to choose from, from those which exclude investments in companies linked to certain controversial activities (negative screening) to those that actively seek out sustainably managed companies (positive screening) to approaches focusing on specific themes that support the foundation’s mission. Learn about Credit Suisse’s offering for foundations. As Credit Suisse is a leader in providing sustainable investing advice and products, the foundation turned to us for advice and support. Get to know our offering in sustainable investment. The Credit Suisse team provided an analysis and screening of the existing portfolio based on the Credit Suisse Sustainability Standards (which are derived from the MSCI ESG ratings). 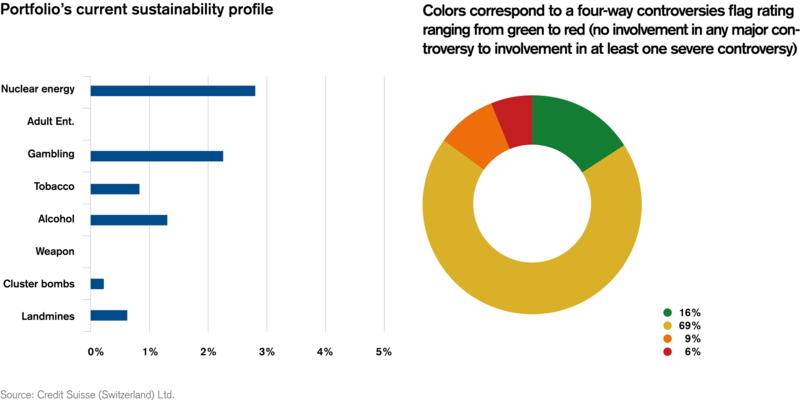 This analysis revealed a number of opportunities for the foundation to reduce sustainability-related portfolio risk, including through divestments of positions in certain controversial industries and companies which contradict the foundation’s mission. Left: Portfolio share in unethical business areas according to Credit Suisse Sustainability standard in %. Right: Percentage of investments in companies involved in ongoing ESG controversies. Source: Credit Suisse AG. At the same time the experts identified a number of areas where the foundation might improve the sustainability of its portfolio. This included increasing sustainable investments via investments in sustainable real estate as well as identifying a number of impact investments that could both support the foundation's mission and contribute to the portfolio's overall performance. Credit Suisse also assisted in drafting the adjusted investment guidelines. Today the foundation’s portfolio is more closely aligned with its mission than it was prior to the review. With a reduced exposure to controversial companies the foundation is not only in a position to better support its goals – it has also gone a long way to mitigating reputational risk associated with its investment choices. The good news is that the changes it made to its investment approach did not require the foundation to make any compromises with regards to the expected returns on the portfolio, or to its volatility. Thanks in part to Credit Suisse's help, the Board was able to strengthen its endowment while at the same time adding positive social and environmental impact over and above the impact it makes through its direct giving.